This Citrine in naturally formed, not heated to speed the natural process. We happened upon an ultra rare find: Naturally formed Citrine!! While it is made from quartz (the most common type of mineral), it is quite rare to find in its natural form. Citrine has a beautiful yellow color which can vary from a light or pale yellow to a yellowish orange. 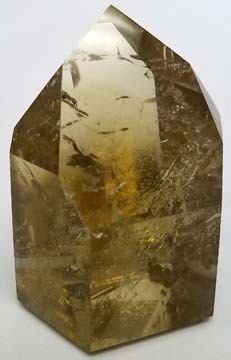 Citrine is the official birthstone for the month of November and is also the Planetary stone for the Sun Sign of Virgo. Citrine is believed to help the heart, kidney, digestive tract, liver, and muscles by the metaphysical community. It promotes creativity, helps personal clarity and eliminates self-destructive tendencies. Get this beautiful, rare stone while it lasts!! Also available in AB-Grade (PMNCP/AB) and Freeform (PMNCDT)! !